It’s quarter of a century since Kate Bush released her landmark single, ‘Running Up That Hill’. That’s scary. I can’t quite believe it’s been that long, but it’s true. I was 16 when it came out, and listening to it today, it still sounds box-fresh. In 1985, Kate Bush was a solid fixture in my life and had been for as long as I had loved music. We are celebrating the anniversary this weekend on Phantom 105.2’s The Kiosk, with Nadine interviewing Graeme Thomson, author of new biography Under The Ivy: The Life & Music of Kate Bush. I’ve been looking forward to this book. 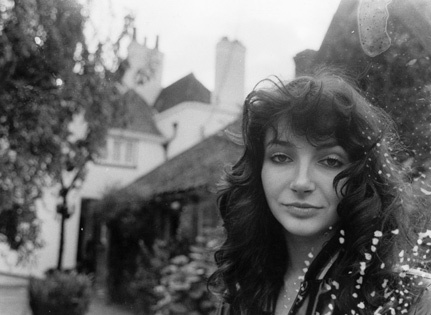 Kate Bush is one of popular music’s most fascinating artists on practically every level. There’s an otherworldliness to her work and background, something distinctly strange and just out of reach about her – and something I’ve never truly wanted to understand in case it breaks the spell. I’ve been under her spell since I was 9. My first single purchase was ‘Wuthering Heights’ in 1978. A first music purchase is a significant moment in anyone’s life, of course, but buying a 7″ single was odd for me because I didn’t own a record player. It was also the only single I owned until 1980. I wasn’t the sort of child who asked for pocket money either, so a bit of saving (and a lot of copper) went into getting it. A friend of my dad’s was a huge fan, something my parents didn’t quite get. They didn’t really like her “squeaky” voice but it didn’t stop him from playing her records in their presence. To be a Kate Bush fan in 1978 must have been a real treat. She released her first two albums before the end of that year and although she was disappointed with her second album Lionheart because EMI rushed the recording and production process to have it out for Christmas, it’s still the work of an artist with talent far beyond her years. She was still only 20 when she recorded it. For me, though, her debut The Kick Inside remains one of the finest records ever made. As we approach the 25th anniversary of her most celebrated album, Hounds Of Love, I still find myself asking people to consider her debut before calling the latter her ‘masterpiece’. It always appears overlooked to me. Not only have the singles ‘Wuthering Heights’ and ‘The Man With The Child In His Eyes’ stood the test of timelessness, several other songs astonish me more and more every time with their craftsmanship. These were songs she had worked on since she was just 13 years old. If you haven’t already done so, I urge you get hold of this album. Listen to eerie opener ‘Moving’ with its ‘hounds of hell’ intro; ‘Strange Phenomena’ with its hypnotic chorus, the precursor to ‘Wow’; ‘Oh To Be In Love’ with its dreamy chords… oh, the whole thing, really. Actually, listen to the song below. It’s the title track, a genuinely extraordinary and tragic work which still takes my breath away. Not only is it musically exquisite, the lyrics have never stopped reducing me to tears – they are a painfully loving suicide note from a girl to her brother by whom she’d become pregnant. Just listen and become smitten. I look forward to listening to Graeme Thomson this weekend. I still consider the slim biography The Secret History of Kate Bush (And the Strange Art on Pop) by Fred Vermorel, which I bought in 1983, as an influence on my musical taste and opinion, and I haven’t read another biography on Kate Bush since. Here goes. Wow. This entry was posted on August 5, 2010 at 11:42 pm and is filed under Books, Music, Radio. You can follow any responses to this entry through the RSS 2.0 feed. You can leave a response, or trackback from your own site. Fabulous article Johnnie. Enjoyed listening to that track again and am inspired to dig out the vinyls this evening.